Building a mechanical watch can be a satisfying project that will result in a unique timepiece to wear. The job, however, requires skill with precision tools and experience in breaking down and assembling a watch. Above all, the project requires practice to master the tools, although the process is much like assembling a bicycle or a piece of furniture. The job requires attention to detail. 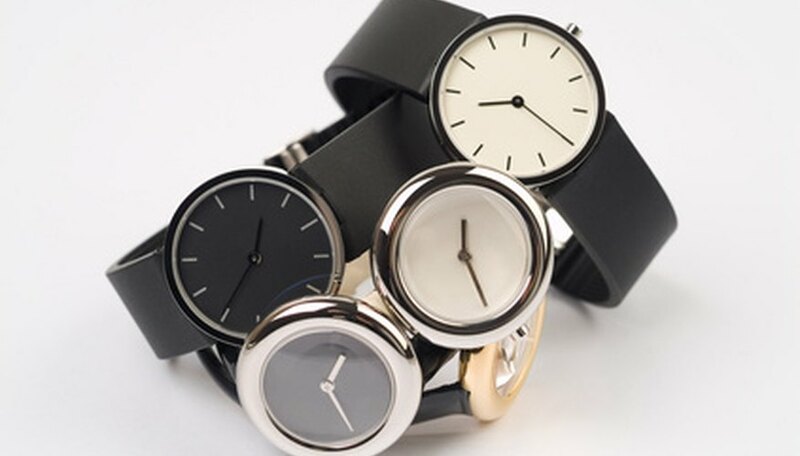 Yet there are techniques that novice watchmakers can employ to produce a quality watch without cutting too many corners. Take a horology course online or at a community college. Learn the architecture of the watch and how to disassemble and reassemble it. Learn how to manipulate small precision watchmaker’s tools. Determine what kind of watch you want: Square, round, a diver’s watch, dress watch, etc. Do not build the movement, which is the spring-loaded engine that operates and regulates the watch. This task requires the extensive skill sets of a professional watchmaker. Purchase the watch parts from the same vendor. Parts from the same vendor provide consistency in parts quality and guarantee they will fit. There are many parts vendors online. Purchase the movement from the parts vendor or at online auction houses. Online auction websites often sell movements for just a few dollars. Have the movement fully cleaned and oiled by a watchmaker to prepare for assembly. Purchase the dial, hands, case, caseback and the crystal, which is the acrylic or glass that covers the dial. The parts vendor can help you with sizes. Ensure the hands fit the dial. The dial and movement should fit snugly into the case. Keep in mind that the dial/movement should be about 1 to 2 mm smaller than the case to fit. Design your dial. You can design the color, the numerals style and even give it a name. You may want to copy an existing dial or use the one you already have. Take the dial and your design to a watchmaker, who will send it to a redialing company that specializes in refinishing dials. They will design the dial to your specifications. Build your watch once all parts are in your possession. Fit the dial on top of the movement by aligning the feet under the dial with the movement. Use a screwdriver to fasten two tiny screws to secure the dial on the movement. Use the hands-grabber/pusher tool to fasten the hands onto the dial. Place one hand at a time in the pusher. Set the feet of the pusher on the dial over the center post. Gently push the hour hand onto the post by squeezing the pusher. Repeat with minute hand and sweeping second hand. Place the crystal into the case. Screw down the bezel, which is a ring that secures the crystal, into the case with the crystal underneath. Install the movement in the case. Use the screwdriver to fasten the movement to the case with two tiny screws. Snap or screw down the caseback. Mount the band or bracelet between the case lugs at the top and bottom of the watch by slipping the retainer bars into the ends of the band and then fitting them into the lugholes. Practice on a cheap or broken watch before tackling your project. Never force anything. You will break something.